Learn how proprioception impacts your sports performance and ways to improve it. It's easy to take your body for granted. Without even thinking, you can move your limbs and balance on two feet. Or more impressively, you can sprint at an extremely high speed or leap several feet for a slam dunk. But behind all of this is a somewhat mysterious system that could be considered a sixth sense. It's called proprioception. Proprioception refers to the body's ability to know where it's located in space. Without you having to look, your brain can direct your finger to your nose—that is unless you are inebriated, which impairs proprioception. Close your eyes and try to touch your nose with your finger. Pretty simple, right? This is proprioception in action. Touching your nose without sight might seem like a mundane task, but it's the result of an incredibly complex process occurring in your body, all without your even knowing that it's happening. Proprioception relies on receptors in your muscles, tendons, joints and skin to measure the position of your joints, the length of your muscles and the force produced by your muscles. The receptors send this information to your brain, which interprets the data to get an understanding of your body's position. This is why you can describe the position of your body when your eyes are closed. It's also the reason why you can stand on two feet. "Our body is five and a half times longer than our base of support," says Paul Gagne, a renown Posturologist and Exercise Physiologist based in Canada. "Pretty much anything you have in your gym or office with that structure will fall down." Have you ever seen a robot try to walk? It looks incredibly clumsy. And most don't stand a chance if you try to knock them down. That's because replicating the body's proprioceptive system in a machine is a complex problem that researchers have not yet completely solved—although they are making significant progress. Put simply, the human body is an incredible machine. Why is Proprioception Important for Sports? A pitcher releases a fastball. You lock onto the ball with your eyes and swing the bat. The bat comes into the zone and strikes the ball, sending it into the outfield. Your proprioceptive system helped to align your bat with the path of the ball. Your eyes knew exactly where the ball was and your bat almost miraculously made contact. This would have been next to impossible if you didn't know where and how your body was moving. You may miss the ball from time to time, but that's likely because of a decision-making or timing issue rather than proprioception. But let's take a step back. Proprioception enables even the most basic athletic movements, such as sprinting, changing directions and landing from a jump. Superior proprioception allows for greater control of your body. You are more precise in your movements because you know exactly where your limbs are in space, leading to faster and more explosive movements and ridiculous feats of athleticism, like Odell Beckham Jr.'s famous one-handed catch. On the other hand, poor proprioception creates sloppy movements. You might describe someone with poor proprioception as "goofy looking." The result is poor performance in sports skills and, worse, an increased risk for injury. Let's say you land from a jump. You need to bend your hips and knees to absorb the landing, and to keep your knees aligned with your hips or ankles. If your knees collapse inward, you run the risk of an ACL injury. Proprioception allows you to understand where your body is so you can execute the proper technique for the movement. Without it, you could land awkwardly and end up with an ACL tear or another catastrophic injury. This is just one example of proprioception's relationship to injuries, but know that you are much safer when you have an accurate model of your body positioning. Proprioception is an essential aspect of athleticism, yet how often do we try to improve it? In fact, many of our daily habits make it worse—mostly due to our habit of wearing shoes. Shoes are comfortable, no doubt. Who wants to walk on the ground? You could end up stepping on something gross or injure your foot on a sharp object. In modern society, shoes are essential. Problem is, we spend far too much time in shoes—or shoes that are far too padded. "An athlete like a gymnast or martial artist, who does a lot of balance drills or whose feet are very active and have had the chance to walk barefoot a lot, has a huge advantage," Gagne explains. "Their proprioceptive system and balance system is way more developed than skiers and hockey players who are stuck in a boot. It's like trying to eat with a boxing glove." Put simply, the feet do much more than just allow you to walk. They provide information to your brain that helps keep you balanced and aware of your body's position. 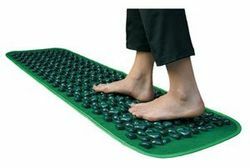 "The feet are more of a sensory device than a support device. If this was not the case, we would not be able to stand on two legs," asserts Gagne. Proprioception falls in the "use it or lose it" category. It can be trained as long as you challenge your body. Once again, it comes down to your feet. Train your feet and you will make dramatic improvements in your proprioception. Gagne has his athletes walk on a cobblestone mat prior to their workouts. According to an Oregon study, the uneven surface appears to improve balance and proprioception, and may even lower blood pressure. "If you have kids at a young age, the same brush you use on the top of their head to avoid deposits [cradle cap], you can brush the foot when they get in the bathtub," Gagne says. "I've done that with my son and many of my athletes, and it improves the sensory organ of the foot very quickly." Need to improve your proprioception? Simply stand on one foot with your eyes closed. Also, try performing your exercises with your eyes closed for an additional challenge, which Joel Seedman, an exercise physiologist and owner of Advanced Human Performance, demonstrates in the video above. You will rely solely on proprioception to perform the lift, which heightens the mind-body connection and awareness of your position. Be careful, though. You won't be able to lift as much weight. The easy way to improve proprioception is to spend less time in your shoes. Obviously you need them in certain circumstances, but take them off more often when you're at home. Also, try performing your dynamic warm-ups without shoes to strengthen the muscles and receptors in your feet.